Commerce Secretary Wilbur Ross announced the investigation Wednesday, noting U.S. production of uranium for military and electric power has decreased to five per cent of its consumption from 49 per cent in 1987. 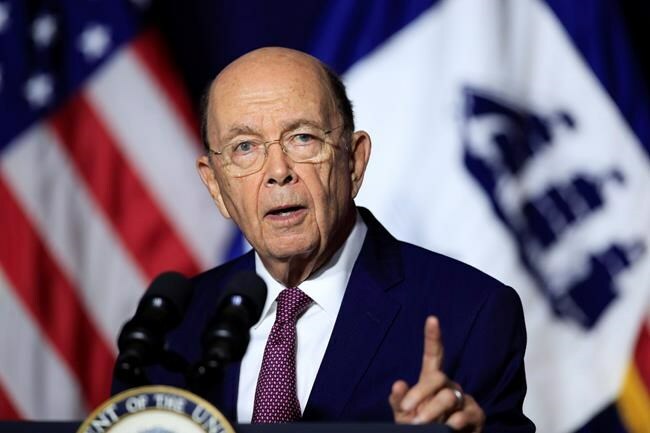 "The Department of Commerce's Bureau of Industry and Security will conduct a thorough, fair, and transparent review to determine whether uranium imports threaten to impair national security," Ross in a statement. Canada is not the target, although all countries are potentially subject to the investigation, said a spokeswoman for two U.S. uranium firms that petitioned the U.S. government in January to take action to help a sector that has been hemorrhaging jobs. "The final form of the remedy will be determined by the Secretary of Commerce and ultimately, the president," Joelle Ziemian wrote in an email. Canada was the largest foreign supplier of uranium to the U.S. in 2016, accounting for 25 per cent of U.S. imports, the U.S. Energy Information Administration said. But Ziemian said that threshold is expected to be cut in half this year because the Canadian industry is also impacted by the unfair global market created by state-sponsored companies. Petitioners Energy Fuels Inc. and Ur-Energy Inc. singled out companies in Russia, Kazakhstan and Uzbekistan that together supplied more than one-third of U.S. demand last year. Domestic producers are projected to fulfil only about two per cent of total U.S. commercial demand. "While U.S. producers can fairly compete with foreign production on a level playing field, it is difficult for them to compete with heavily subsidized foreign production," they said in a joint statement. The companies added they expected more nuclear fuel from state-subsidized companies in Russia and China will be imported in the coming years, likely further displacing U.S. production. "If Russia and its allies take control of this critical fuel, the threat to U.S. national and energy security would be incalculable." Canada is the world's second-largest producer of uranium after Kazakhstan, with 23 per cent of global production in 2016, said Natural Resources Canada. The country produced 14 kilotonnes of the ore, all coming from Saskatchewan mines. The head of Cameco Inc., Canada's largest uranium producer, said it's too early to say what impact the investigation will have, but that Canada and the company are aligned with U.S. interests. "If the issue in question is the overreliance of the United States on uranium supplied by state-controlled enterprises from countries not aligned with American policy interests, this clearly does not apply to Canada or Cameco," said CEO Tim Gitzel in a statement. Ken Neumann, Canadian director of the United Steelworkers, said there's no evidence to justify Canada's inclusion in the investigation. "It is abundantly clear that Canadian uranium exports do not present a national security threat to the United States," said Neumann in a statement. The investigation came as Prime Minister Justin Trudeau shuffled his cabinet partly designed to signal Canada's intention to redouble efforts to diversify its trading partners in the face of U.S. protectionism. Canada and the United States are staunch military allies and Canadian uranium is not a threat to U.S. national security, said Adam Austen, a spokesman for Foreign Affairs Minister Chrystia Freeland. "Measures that shut out Canadian uranium imports would harm U.S. reactors that rely on long-term contracts with Canadian suppliers of uranium," he wrote in an email. Canada shares concerns about the overproduction of uranium in certain countries and has been working with the U.S. to address the issue of global excess capacity, Austen added. Ross said the investigation will canvass the uranium sector from mining through enrichment, defence and industrial consumption. Uranium fuels 99 U.S. commercial nuclear reactors that produce 20 per cent of the power for the country's electricity grid. It is also needed for its nuclear arsenal and powers submarines and aircraft carriers. Under Canada's nuclear non-proliferation policy, Canadian uranium can be used only for peaceful purposes. The investigation comes a day before the department holds a hearing on whether the imports of automobiles and automotive parts threaten U.S. national security. The department has 270 days to investigate and report to the president, who has up to 90 days to act on Ross's recommendations. In their petition, the companies proposed import quotas that would reserve one quarter of the U.S. market for domestic uranium production. They also want U.S. federal utilities and agencies to buy U.S. uranium in accordance with President Donald Trump's Buy American policy.